KAREN AND RAYS TRAVELS: 34 Aviemore..
A 5 hour drive including a drive over the Forth Road Bridge saw us pull into the campsite at Lock Morlich just as darkness was decending. We do not like to arrive at campsites in the darkness. I popped into reception, informed the lady on the desk that we had arrived and gave my name. "You are not on my list" was the reply. Now, we all know the "your names not on the list" thing. My reply was, Oh yes I am, I've paid a deposit. "I'm sorry sir, no you haven't, are you at the correct campsite". "Of course I am, this is Rothiemurchus isn't it.". "No, thats 4 miles back down the road". A 4 mile drive with my tail between my legs and we arrived at the proper place in complete darkness. Plonker ! A black and white night time piccy of our camp site. I booked us in, paid the ballance and was told not to let the cat out. 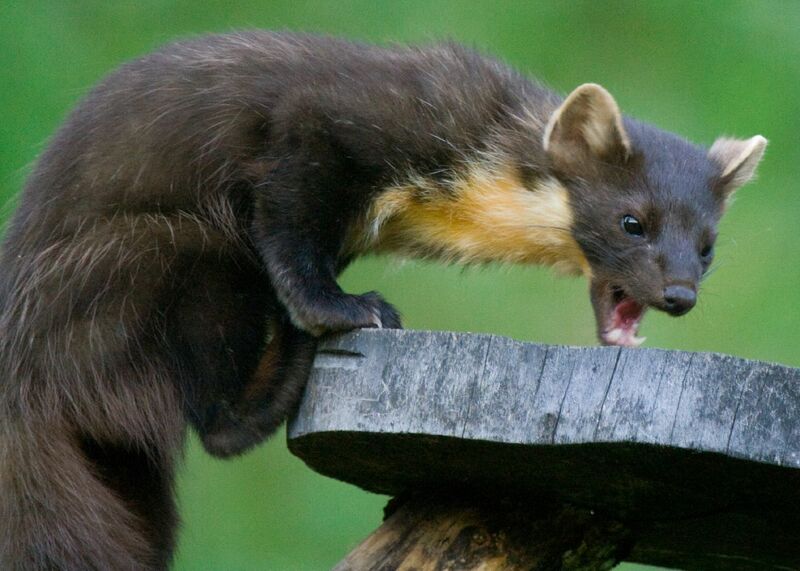 Apparently they can be prey to the Pine Martins. A cute carniverous, cat sized creature with a real bad temper and very sharp teeth. Next day, the 20th Jan, we slowly sorted ourselves out with our ski gear and caught the bus up to the slopes. There was not much snow about on the lower slopes. £30 each and a short funicular train ride later, it was apparent that there was not much snow further up either. There was a lot of whiter stuff, but most of it was ice - it was rubbish. The worst snow conditions I have seen since I was last there as a teenager in 1974. However we had a couple of runs and lots of coffee. Karen was having problems with her boots so we called it a day. We made our way into the town of Aviemore and bought Karen a better pair of boots and then scrounged a lift from Bruce to his accommodation for tea and biscuits. Next day we did the same again, spent and extortionate amount of money for a rip off ski system. There are no proper chair lifts, except the one bought from Europe just after the iron age but that was not working anyway. All the rest are "T" bars or button lifts. For those that do not ski, a "T" bar is like a huge rubber pick axe on a rope extending to a steel cable being dragged up and down the mountain. 2 people sit on each side of the head of the pick axe and get dragged up the slope. Its hard work to say the least. The button is worse. Instead of a pick axe head, it is a disc the size of a small plate that you shove between your legs and it drags you up the slope by your goolies. We did a few runs and then laughed at people in the cafe who thought it was good. We jacked it in and went home to get cleaned up for Bruces dog sled pre race meeting, which was opposite our campsite in the Hilton hotel. As a bonus, there was a free whiskey tasting for all competitors and we ended up with 6 tasters as we were given them by the non drinkers. Was our luck changing. Dog race day 1. We set the alarm on my phone (for the first time since retirement...he...he) and got up at 7am. We sorted ourselves out knowing that the bus would come past at about 8:25am. At 8:18 as we walked the 50m to the bus stop, the bloody thing drove past us. Bugger. A quick call for a horribly expensive 4 mile cab ride back to the same camp site that we originally turned up at and the place was completely awash with all the worlds siberian huskies. They were everywhere, Bruce states that there are about 1500 in total - he should have an idea, he is a commitee member for the Siberian Husky Club of Great Britain and having been a"Musher" for about 28 years. It was complete pandemonium. Nothing else comes close to a description. Bruce was due to set of second at 9:32am with 7 dogs in the premier "A" class (7 or 8 dogs). Along with Bruce was a friend of his called Chris. Chris is an ex paratrooper having served in the falklands during the conflict at the same time as me. With 7 dogs and a rig to prepare, Bruce needed a hand and we were drafted in to hold on to some of his dogs whilst setting up. These dogs are as strong as oxen and all they want to do is run but at the same time they are extremely human friendly and love being petted. When they are being hooked up to the sled (actually a 3 wheeled kart - no snow for the proper sleds as stated above) they know they are going running and are difficult to control. On top of this, they are among the most handsome dogs in the world, the ice blue eyes and striking faces make them extremely desireable pets, unfortunately, all they want to do is run, so unless you can run 7 miles at 20mph, they make bad pets. Some of the 43 huskies that Bruce keeps.